When Congress leader Sajjan Kumar was convicted last month for his role in the 1984 pogrom against Sikhs, a bank peon in Mumbai felt a sense of vindication. Farooq Mapkar’s struggle of 26 years to bring a Mumbai policeman to trial suddenly didn’t seem so long. Mapkar, 53, has become the face of the victims of the 1992-93 Bombay riots — the only man still fighting to right the wrong done to him on January10,1993. Riots were raging across the city that Sunday, but Mapkar, like his neighbours in the small self-contained settlement behind Wadala’s Hari Masjid, didn’t think twice before going to the masjid for the one o’clock namaz. Even before the namaz began, six people had been shot dead, four of them inside the masjid. Mapkar, who was 27 then, was shot in the shoulder as he bent down to pray. The Srikrishna Commission, which inquired into the causes of the 1992-93 riots, heard that sub-inspector Nikhil Kapse opened fire to control a crowd of Muslims attacking Hindu properties outside Hari Masjid. But the police could not provide any evidence of such rioting to the commission or the court. All 54 Muslims arrested from the spot on the charge of rioting, including Mapkar, were acquitted. The Hari Masjid firing was one of the only two riot incidents where an officer of another force, the SRP, chided the Mumbai police for their excessive acts against unarmed Muslims. It’s also the only case where a victim has not given up the fight for justice. 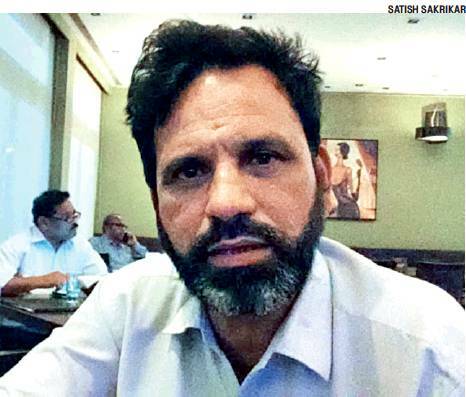 Nothing has deterred Mapkar — neither the assault on him by Shiv Sainiks at KEM Hospital, where he was treated a gunshot wound, nor the separation of his rioting case from the other accused because the magistrate didn’t like his lawyer’s line of questioning. In 1998, shortly after the commission’s report indicted Kapse for “unjustified firing and brutal and inhuman conduct”, the sub-inspector’s victims told this reporter they would do whatever it took to get him to trial. Some had lost breadwinners in the firing, others had suffered injuries which rendered them invalid for years. Today, they look at Mapkar with awe and gratitude as he fights alone. Mapkar doesn’t blame them. “Their first concern was to clear their names from that rioting case,” he said. “After the commission concluded that the case was false, the Congress government should have withdrawn it.” Instead, the acquittal took13 years. “People get tired. They have to earn a living too. Then, there’s a fear of the police,” Mapkar said. That’s something this bank peon has never felt. Immediately after he was released from custody, he filed an affidavit before the Indian People’s Human Rights Tribunal inquiring into the riots. The tribunal was headed by Justices SM Daud and H Suresh. In front of the Srikrishna Commission, he described how Kapse fired his weapon point-blank at an injured namazi. Mapkar didn’t hesitate when the magistrate hearing his rioting case challenged him to cross-examine two policemen in the absence of his lawyer. Finally, tired of waiting for the government to act, he filed a private complaint against Kapse. Immediately, the police slapped a new case against Mapkar. (He was acquitted in 2009.) His complaint resulted in the Bombay High Court ordering a CBI inquiry into the Hari Masjid firing, which it said “affects the very soul of India”. After17 years, the victims got a chance to tell an official investigation agency how Kapse shot at unarmed namazis. The CBI, however, chose to disbelieve them, saying they could not be “impartial” as they had been arrested and charged by Kapse. It filed a closure report in the case. So what makes Mapkar persist even after two magistrates arbitrarily dismissed his appeal against the CBI’s closure report? The support of his employers, including a permanent job, has helped: he was introduced at one AGM as a role model. But what really drives him is the anger at the injustice meted out to him. Mapkar’s father, a port trust employee, taught him never to break any laws, a rule Mapkar followed scrupulously. Yet, he was shot at, arrested, assaulted and charged with attempt to murder. Only because he was Muslim, he says. His long and lonely struggle could have turned Mapkar into a fanatic. Instead, he participates in every programme organised by secular groups. “The small team of activists and lawyers that has stood by me has more Hindus than Muslims,” he said. Those who have fought for him without any fee include senior lawyers Vijay Pradhan, Yusuf Muchhala, Yug Chaudhry, Vijay Hiremath and Shakil Ahmed. “Muslims are scared to get involved. But they are foolish if they think the fire that burnt their neighbour’s house will leave them untouched. The more we fight the police, the less are the chances of innocents dying at their hands,” Mapkar said.